Peace appeals to Catherine, but helping the man who broke her heart does not. She delays ... until attempts on Samuel's life convince her he's in mortal danger. Against her better judgment she helps him flee by river, using knowledge of the landscape to creep ever closer to freedom. Their time together rekindles feelings she thought long buried, and danger seems to hound their every mile. She's risked becoming a traitor by choosing a side, but will the decision cost her even more than she anticipated? 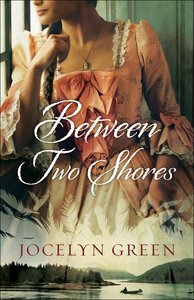 About "Between Two Shores (#01 in Brides Of France Series)"
JOCELYN GREENis an award-winning author, freelance writer and editor. A former military wife, she authored, along with contributing writers, Faith Deployed: Daily Encouragement for Military Wives (Moody 2008) and Faith Deployed . . . Again: More Daily Encouragement for Military Wives (Moody 2011). Jocelyn is also co-author for Battlefields & Blessings: Stories of Faith and Courage from the War in Iraq & Afghanistan (AMG Publishers 2009), which won the Gold Medal from Military Writers Society of America in 2010. She is the editor of www.WivesinBloom.com , the online magazine of Christian Military Wives, and maintains her own award-winning Web site for military wives at www.faithdeployed.com . She holds a B.A. in English from Taylor University, and is an active member of the Evangelical Press Association, the Advanced Writers and Speakers Association and the Christian Authors Network. She and her husband have two children and reside in Cedar Falls, Iowa. Expected to ship within 7 hours from Australia.